A state of natural disaster is to be declared in France’s areas worst hit by flooding in recent days, President Francois Hollande says. The measure frees up funds, with some towns in central France suffering their severest floods in decades. 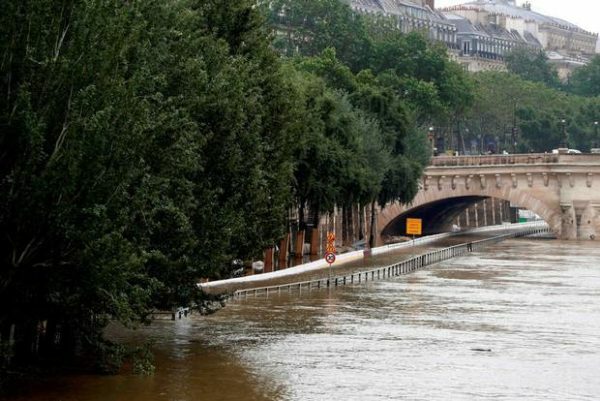 In the French capital, the Seine continues to rise, prompting the closure of a metro line running through the city centre. More downpours are forecast right through the weekend across a band of central Europe from France to Ukraine, with as much as 2in of rain falling in some parts in just a few hours. After a day of respite on June 1 in central France, the region is braced for a further rise in already exceptionally high river levels. Nearly 10,000 homes are without electricity. France’s PM Manuel Valls visited the stricken town of Nemours on June 1. Nemours Mayor Valerie Lacroute said 3,000 people had been evacuated from the town center. The town’s Loing river, a tributary of the Seine, now has levels not seen since the devastating floods of 1910. “The center of town is totally under water. All the businesses have been destroyed,” said Mayor Valerie Lacroute. Six weeks’ worth of rain has fallen in three days in the Loiret department.